Yet another Crisis on a Monday morning . . . could this all be leading to something? Posted on Monday, January 14, 2019 Saturday, December 22, 2018 by GaryPosted in Mash-UpTagged Captain Marvel, Superman. Superman’s going to have to pretty persuasive with whatever big speech he’d have to roll out because both E2 heroes are waaaaay more powerful than him when it comes power set. You really think Captain Marvel can beat him? I know they’ve fought a bunch of times, but my money would always be on Superman. In the courts yes, comics…Well Kingdom Come pretty much answered that one. 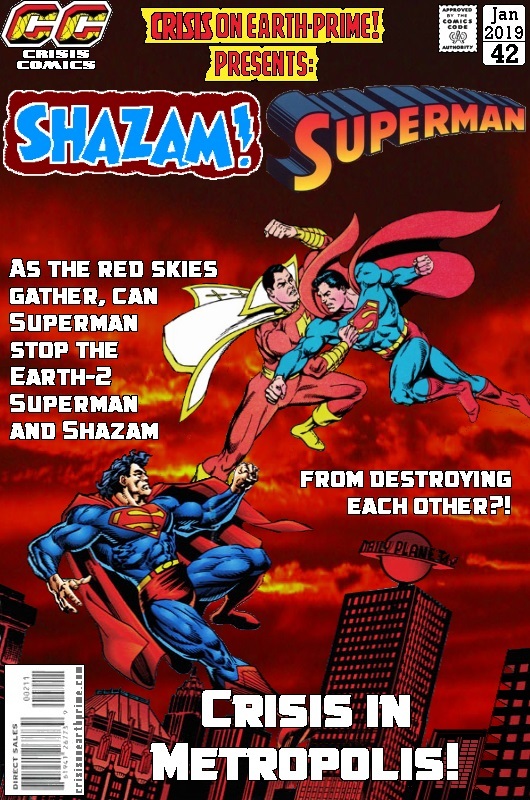 Now the Earth 2 (original) Superman could possibly win, but for damn sure not the current one. Ah, but the Kingdom Come Superman was able to stop Marvel – remember that scene with him clenching Billy’s jaw shut despite having taken multiple magical lightning bolts?